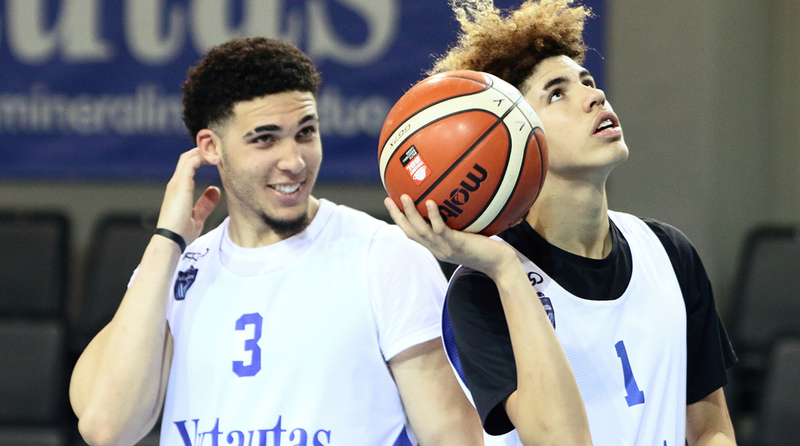 While their father generates endless headlines, LaMelo and LiAngelo Ball are quietly trying to find their footing in Lithuania. The Ball brothers spoke to The Crossover about life overseas, their new team and more. While most teenagers would be astonished by a packed press conference in a foreign country being held on their behalf, LaMelo and LiAngelo Ball are not most teenagers. The brothers looked cool and relaxed as they took their seats in the Harmony Park hotel ballroom in Lithuania on Friday. LaMelo even reclined in his chair, leaning back as a horde of more than 50 reporters crowded around. Both brothers hardly flinched as the camera flashes and surreal questions came firing one after another. For two teenagers who have a camera crew shadowing them every day, and more social media followers than most NBA stars, it was just business as usual. And if you ask the Ball brothers, that's exactly how they're approaching the start of their pro careers in Lithuania. They're sacrificing the fair weather and diversity of SoCal for the freezing winters and simplicity of Prienai, a countryside population of around 10,000. Their focus is all basketball. In fact, LaMelo, who's a die-hard gamer, even left his PlayStation 4 at home. On Sunday, the brothers spoke exclusively with The Crossover on adjusting to life in Lithuania, preparing for their debuts (Tuesday at 1:30 p.m. ET), developing their skills, receiving advice from LaVar and Lonzo and more. Jared Zwerling: Tell me your first reaction when you heard you were coming to Lithuania. LaMelo Ball: "I heard it was real far away, just living-wise. I heard a lot of people didn't speak English and it was real cold. But then when we got here, actually a lot of people did speak English and it wasn't as cold as we expected. And then basketball-wise, I just know I would come here to play basketball, and that's pretty much it." LiAngelo Ball: "Oh, it was exciting. I knew I was coming to play, so that was just exciting for me. The only thing different is the language and the food—that's it—and the weather probably." JZ: What's been nice with how the country has welcomed you? LaMelo: "It was real nice of them. The first night we got here, they gave us dinner and stuff. They showed us the hotel and all that to live in, and stuff like that. It was real nice of them." LiAngelo: "They seemed real excited for us to be here, like there was a lot of people at the airport and stuff when we landed. And it just feels welcoming for us to see." JZ: What's been the craziest or most interesting thing you've seen since you've arrived? LaMelo: "I've seen a lot of kids and they seem like big fans. It seems like everyone out here likes basketball and stuff, and that's nice. And then all the reporters, they're kind of the same like L.A., especially that one female [reporter] who asked Gelo out pretty much." LiAngelo: "Other than that, I haven't seen nothing crazy." JZ: Have you seen the video the Lithuanian rapper made for you? LaMelo: "She's got a jacket on or something? Yeah, that was a little different." LiAngelo: "Nah, I didn't see that." JZ: What's it been like bonding with your new teammates on the court and getting a chance to know them? LaMelo: "When the coach says something—he speaks some English—then the players just tell you what he said in English. So they're helping me there. And they're showing me the offense and stuff like that. And I also got dinner with them and stuff, bonding time, and they all seem like cool people." LiAngelo: "Oh, they've been good. I mean, they're all nice and stuff. They all talk to me. They help me with what the coach is saying and stuff, like if the coach can't get it to me. It's been a cool experience. We had practice; that was cool. We met with the new team and stuff. They put us in a good hotel, so the experience has been good." JZ: What kind of offense are they running, and how do you see it playing to each of your strengths at point and on the wing? LaMelo: "Well, the last practice was pretty much like normal basketball—pick-and-roll, find the open man, someone in front of you give it to him. Just what we've been doing." LiAngelo: "I think they just run motion and stuff. They're not really too heavy on like the hard play or nothing. It's not just one-on-one. I feel like I can run a good game." JZ: In what ways are you preparing for your debut on Tuesday? LaMelo: "For me, just getting in the gym practicing with them. I'm going to go tonight, getting up shots and stuff like that." LiAngelo: "Just getting in the gym. My mindset is strong going into the game, like I never go into the game nervous or nothing. So that's good." JZ: How do you want to use this time in Europe to improve your games? LaMelo: "Just go out there and play, adapt to the game, only get better. It's only about growing there. They seem like they play real good basketball—everyone's passing, unselfish pretty much it seems like. Just adapt to that." LiAngelo: "I like to get better in every way, every time I play. So if that means defense or offense, I'll take what I can benefit from. Every time I play, I just learn something new and add it to my game. My goal is to get into the NBA this year." JZ: How do you envision playing off of each other? LaMelo: "I've been playing with Gelo for a long time, so pretty much I know where he's going to be and stuff like that. So that's going to help a lot." LiAngelo: "I feel like it'll be great because we've been playing since we were little together. So we know how each other plays, especially in this system where they just like to run and shoot and stuff. So that will be good for me and Melo." JZ: Off the court, how do you think you'll spend your off days? It's such a different lifestyle than Los Angeles. LaMelo: "Usually just if it's not basketball, we're probably in the room just watching movies or Netlifx, or something like that—just kicking back. On Netflix, actually I found this one thing called Trollhunters and now I'm just watching [The] Flash." LiAngelo: "It doesn't bother me because me and Melo are together, so that's cool. We're just here to play basketball. We didn't come for nothing else, so that's cool." JZ: What's the biggest thing do you think you'll miss about being in high school and college? LaMelo: "[Laughs] Not really nothing. Just my friends and stuff like that." LiAngelo: "Nah, I'm good right now. I like where I'm at right now." JZ: Your parents are planning to stay out here for six weeks or more. What does that strong support mean to you? LaMelo: "It's great. You know you've got support, and it's been with me my whole life, so that's real nice." LiAngelo: "It's just good to know that your family's got your back, so it's going to be cool having them out here, and just knowing that they're here to watch us and stuff and supporting us. It's always good." JZ: What's the advice from your parents? LaMelo: "Basketball-wise, you just go out there and play. It's all on you." LiAngelo: "They said when we come here, just play our game. Like don't be nervous or nothing—just do what you love to do. You're here to play basketball." JZ: How about from Lonzo? LaMelo: "Pretty much just stay in the gym, always try to get better, and don't get distracted and just stay focused." LiAngelo: "Pretty much the same thing like my parents. Zo is telling us to stay focused. And I'm here for you when you get back." JZ: What's it like having a film crew tag along with you every step of the way? LaMelo: "It's pretty normal. They've been around a long time. We all know each other, so it's not even like a film crew." LiAngelo: "It doesn't bother me. They've been around for a long time, so I got used to it. I think it helps me with TV because you get more comfortable around cameras and stuff. It helps you in that category." JZ: From a social media standpoint, each of your following resembles that of an NBA star. Is that crazy, have you gotten used to it? LaMelo: "I've gotten used to it." LiAngelo: "I don't get too high on that stuff, like I never really looked at it like that. It kind of just happened." JZ: What's something about you that your followers overlook or don't know enough about? LaMelo: "That I love PS4. I love video games, man. We play 2K a lot, so that's something. I use the Warriors [laughs]. Everybody says it's cheating, but, nah, I just use KD—that's it. LiAngelo doesn't really play 2K like that, but when he does, he picks the Wizards for John Wall and Bradley Beal. LiAngelo: "I like to rap sometimes with Zo, and people tell me I'm pretty funny sometimes when they get to know me. But that's about it." JZ: Did you bring PS4 out here? LaMelo: "Nah, I didn't actually. I just have Netflix." JZ: It sounds like the focus is all basketball.